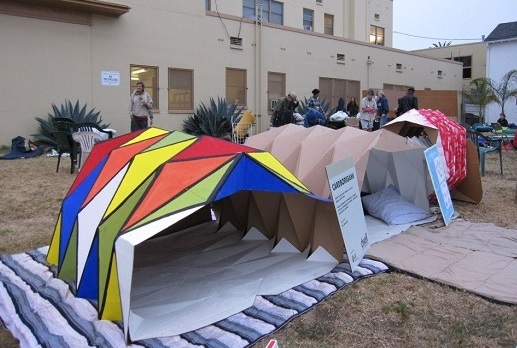 Architect Tina Hovsepian is quickly becoming a godsend for the homeless, globally. 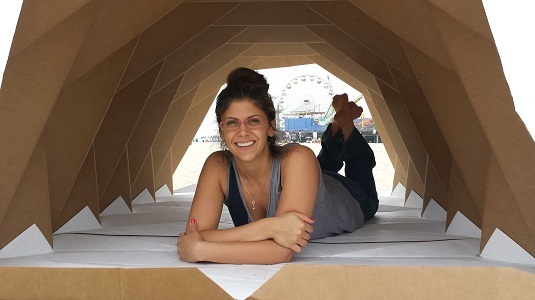 When I saw her unique design of a portable cardboard home based on origami, the ancient art of paperfolding, I was fascinated by the simplicity and genius behind it. Tina calls her shelter cardborigami. And, Cardborigami is also her proactive organization for transitioning one homeless person at a time off the streets. People from Nepal and 92 different countries are already interested in obtaining and learning more about Tina’s invention. She took some valuable time out from her schedule in Los Angeles to speak with me about her visionary ideas…. EYE: What does a portable shelter mean to a homeless person? TINA: In addition to providing a safe space, there is a psychological aspect of it. A person has ownership of something that is useful and looks nice. 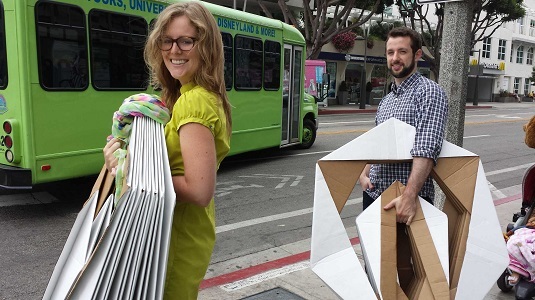 Cardborigami provides a jumpstart for someone who doesn’t have much. It provides privacy, which you and I take for granted. Even if the homeless go into a shelter or program, there are usually beds in a big room. Again, they are exposed to the public or everyone around them. Finally this shelter is aesthetically pleasing which is meant to be uplifting, supporting the idea of feeling better about oneself. EYE: How is it better than a tent? TINA: There is no assembly required. There is initial construction but that is done on the front end. Once you get it, you simply pull it open and it’s ready to go. It’s sturdier than a tent, weighing only 20 pounds. It loads better and it’s a little more insulated. Instead of a layer of plastic, it has little air gaps inherent in the cardboard material providing a little bit of insulation which means it’s warmer inside when it’s cooler outside and cooler inside when it’s warmer outside. Cardboard is protection between you and the “floor.” It’s all treated to be really good at resisting water, making it last a lot longer if there is moisture and mold. EYE: Have you spent a night or two in it yourself? TINA: Volunteers, board members and I spent a night recently at Sleep Out To End Homelessness in Venice Beach. It was to point out how laws against people sleeping in their cars were ridiculous since they have no place to go or sleep. We gave out some of the shelters to protectors there including some homeless people. That night was really cold and it was sprinkling. One woman got so warm she had to take off her jacket. The feedback on the shelter and the personal street stories were important to me there and when we visited Skid Row several times.. EYE: Is there a limit to how many times cardborigami can be opened and closed? TINA: We know for sure we can open and close it 40 times. For my standards that is little, but I’ve been told that is a lot for what is even needed in a disaster situation. Because these are transitional shelters, we don’t want people to live in these for too long; we want to have them in permanent places in 10-12 months. These should last ten months. Ideally we don’t want them to have to. EYE: You’ve said this is not meant to be a handout. How does the overall program work? TINA: Cardborigami’s goal is ending homelessness or filling some gaps. We partner with organizations, which have connections and facilities, where these shelters can be used safely. We are in talks with different organizations in LA and are working to launch by winter of this year. Once someone has gone through Cardborigami’s four-step program, they will be in a position to navigate society on their own. (1) People use cardborigami on safe property. (2) Our organization will get people access to social services they need. (3) Permanent housing is obtained through vouchers and other available methods. (4) People can keep their houses through employment. We will hire people to assemble the shelters, partnering with entrepreneurship programs or other job placement organizations. EYE: What intrigues you about the homeless that got you started? TINA: I grew up in LA, which is the U.S. capital for homelessness. I constantly saw the negative reactions toward the homeless. People would ignore them, or they would take a step back if they tried to talk to you. As a kid I would ask why it was this way? The main inspiration for doing something about it happened when I traveled around Southeast Asia stopping in Cambodia with my architecture program at the University of Southern California. We visited an elementary school, which we were supposed to redesign and also visited the surrounding village. Right then I decided to give back. If I am so privileged, then it is my responsibility to give back. 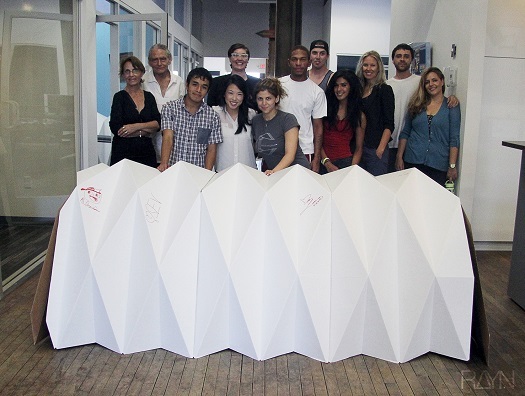 The very next semester at USC, I had my project assignment and I designed the cardborigami structure. Tina’s colleagues show how portable the shelter is. EYE: Is there an inspiration for your structure? TINA: I was really influenced by Shigeru Ban who builds everything out of paper. Waterproof and fireproof are important when you are building permanent structures. EYE: How did you finance this? TINA: One cardborigami structure costs $30.00. Because of design awards, prize money and publicity, I tapped into different networks, social media, and networking opportunities, and then met people who believed in how this could help. People are reaching out to me with financing. We had a lot of small original donors, and we continue to get grants from companies like Annenberg and Toyota. EYE: You also have a day job at Callison, a premier architecture firm. What are you working on now? TINA: I am working on designing the expansion of a new wing in the biggest outdoor mall in the U.S. in Hawaii, Ala Moana Shopping Center. The man hired me at this wonderful firm because of my cardborigami project and the firm has supported my efforts in so many ways. In fact, employees helped me build 20 shelters. EYE: What kind of architecture intrigues you? TINA: I like super small intimate things that are easy to understand, like cardborigami. I am even more interested in large, mixed-use buildings. In the ideal sustainable organization of the future, there would be huge developments built around transportation hubs. It’s not only a sustainable way of living but also the buildings and materials would be sustainable. How to generate energy with buildings is another major interest of mine. I am really geared to the future and how to make the world a better place. EYE: What advice would you have for young women who want to be architects? TINA: Be super confident. We naturally nurture. We already have what it takes to make the world a better place. We have to be confident enough to do it. Whatever you do is going to be better than what is already out there. Don’t be scared. Do it. EYE: What do see in your future? TINA: I want Cardborigami to be a sustainable organization, even without me. Having that under my belt, I would like to be a successful architect, designing environmentally, sustainable and socially responsible buildings. Most built environments are built by developers, not by architects. I want that to change. I envision making housing that pays for itself, that looks good, not only for homeless to transition into, but for people in general to live so there would be ideal social integration. EYE: Is it my understanding that requests for cardborigami come from as far away as Nepal? TINA: Yes. That happened the day after I spoke at the Women in the World event in New York. Through Twitter and social media, many people thought that would be a perfect solution for all the crumbled houses because of the recent earthquake. The President of the Nepalese Foundation of the U.S. called us and said she had funding for such assistance. Subsequently, now that we are participating in a UN Habitat Mission, I will be going to Nepal mid-June to early July. I will be setting up useful mapping instruments to identify vulnerable households in troubled regions and also develop a monsoon impact map. I personally will extend my stay, visit the manufacturer in China, and import cardborigami shelters where they are needed. EYE: Do you see a commercial use for these shelters as well? TINA: There are many applications, from shelters for people in Syria and Iraq who have no home at all to a children’s toy or camping and so on. The profits from the commercial side will be used to help fund the nonprofit activity. EYE: I read your description of yourself: “architect+social entrepreneur/extraordinary+at least half crazy.” Explain! TINA: I really believe when you are in the trenches, you must get loose, get crazy, laugh and then get back to work. There is a saying that “there is no genius without madness.” I have experienced that I guess! EYE: As Tina noted at one point in our conversation, homelessness can happen to anyone. 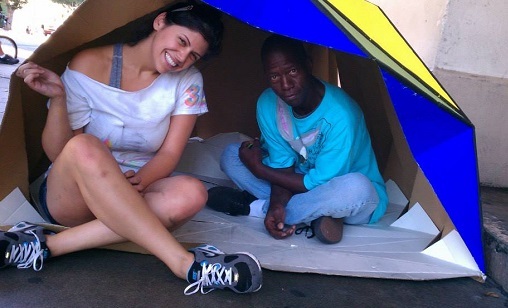 Much success to you, Tina, as you increase awareness for the homeless and continue to innovate beyond Cardborigami.